This 18km section of walking or cycling track is part of a much longer tramp between Petone and the Wairarapa south coast. The section starting from Upper Hutt is reasonably well suited to families as it’s only slightly inclined going up towards the summit, so a gentle ride in each direction. Bike riders will need to be fairly confident but the track is mostly wide and while gravel based, isn’t too bumpy! This is in contrast to the ride starting from the Wairarapa side, for which the track is very narrow and winds through bush including over a few bridges up to the old Cross Creek railway station. From here until the summit, the track is wider but very steep. It is also exposed to northerly winds, which can make the cycling even harder for little legs! This section is best suited to kids on bikes with gears that they are confident in using! And calm days!! The typical place to start is the Kaitoke carpark, roughly 10km north of Upper Hutt (see contact info for directions). 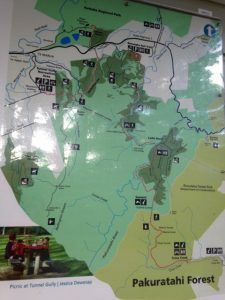 There are toilets here and information boards including a map of the trail. The track has little shade, so you’ll need plenty of sun protection on hot days (long sleeves, sunblock and sunglasses). Similarly it’s quite exposed in places and if your kids are slow walkers/riders, you might need some extra layers. If you’re leaving from Wellington, remember that the weather can be quite different here, so it’s worth being prepared for everything! If you go the full 18km to Cross Creek, there are several bridges to cross and old railway tunnels to go through. The latter are very dark and you’ll need torches or bike lights which adds to the excitement! Head lamps are great for cyclists so your hands are still free for steering. The first tunnel from Kaitoke carpark (Pakuratahi Tunnel) is roughly 2km away but then the others are quite some distance between the Summit and Cross Creek. You’ll need to take all your food and enough water with you as there’s nothing around. Address: Start at either Kaitoke carpark, Upper Hutt. Turn off SH 2, 9 km north of Upper Hutt, the turn off is signposted to Pakuratahi Forest. The carpark is 1 km along, after the Kaitoke Kart Track. Or start in the Wairarapa at Cross Creek. Turn onto Moore St, Featherston, continue into Western Lake Rd, and turn right onto Cross Creek Road.